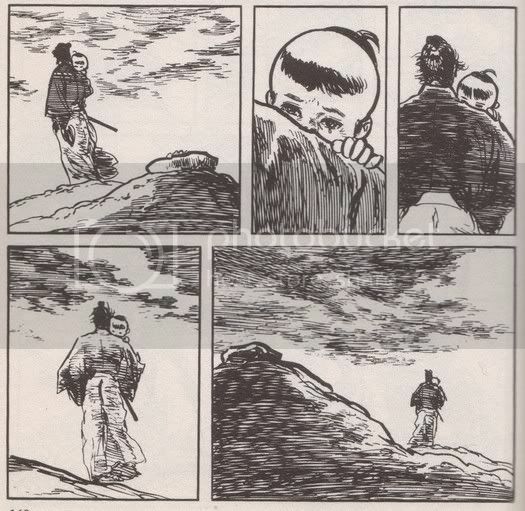 One of the most haunting questions about Lone Wolf & Cub is the question of what Daigoro would do, if given the choice. If you ask Itto, of course, Daigoro did choose. In the penultimate story of the first volume, "The Assassin's Road," Itto resolves to become an assassin in order to seek vengeance against the Yagyu clan, but he feels Daigoro himself must choose whether or not to follow. Though Daigoro is still a chubby newborn, Itto trusts the boy's samurai blood to make the choice. On one side of the room Itto places a child's ball. On the other, he plants a sword in the floor. If Daigoro chooses the ball, it means he wants to remain a child and Itto will kill him so he may be with his murdered mother. If he chooses the sword, then it means he wishes to follow his father on the road to hell. Daigoro chooses the sword. Of course, that could just be because the damn thing was shinier. That isn't meant as sarcastic or irreverent as it reads. Itto's voice is an authoritative one, and as readers we are meant to trust his judgment. His justification for bringing his son along on his vengeful quest; for using Daigoro as bait, distraction, and shield; and for proclaiming to any that protest that "a father knows his child's heart as only a child can know his father's" - as he does to the ronin Furizue Geki in the first volume - is based on Itto's faith that it was more than a child's random attention that inspired Daigoro to choose the sword over the ball. 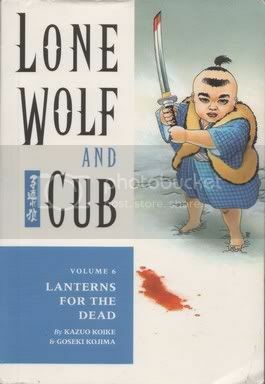 Few volumes of Lone Wolf & Cub will make you question that assumption more than Lanterns for the Dead. Lanterns for the Dead includes a story that is perhaps the most heart-breakingly painful to read in the series. Whenever I re-read Lone Wolf & Cub, it's a story I anticipate with a certain degree of dread. It's too good to skip, it's too important to skip, but it is so hard to read in spite of the fact that - even if you've never read it - as soon as the first few pages you know how it will end. In "Hunger Town" Ogami Itto uses a new device to get his target out of hiding: a dog. Itto's target is a despotic lord his people know as the Red Demon. The Red Demon is a fan of Inu-oi or "the dog chase." A dog is released while an archer tries to hit it with an arrow before it can escape. Using arrows with blunted tips, Itto trains a dog for weeks to anticipate and dodge the arrows, trusting the dog will survive long enough to lure Itto's target out of the safety of his castle. Daigoro names the dog Chiro and helps in his training. It is Daigoro that Chiro runs to as he dodges Itto's arrows. Daigoro feeds Chiro, sleeps with him, and when starving townsfolk charge Itto and Daigoro in hopes of snatching the dog and eating it, it is Daigoro who holds the dog tightly to his chest to protect him. The Red Demon's retainers eventually commandeer the dog, as Itto plans, for their lord's Inu-oi, and the result is precisely what you would think it would be. It is a horrible loss for Daigoro, and if it doesn't make your eyes well up just a little bit then you must have surgically altered your face. It is a joy to watch Daigoro in the beginning of "Hunger Town" finally given the kind of thing a normal boy or girl would enjoy, and to have it so brutally taken from him is the kind of sad you remember days after. I never hate Itto more than I do when I read "Hunger Town." Daigoro is witness to quite a lot of bloodletting in Lone Wolf & Cub, and in fact he causes a bit of his own both directly and indirectly. In spite of this, when Itto slaughters the Red Demon at the end of "Hunger Town," it is perhaps the only time you get the sense Daigoro is happy to watch a man die. The following story, "The Soldier is the Castle," is important plot-wise in that it multiplies Lone Wolf and Cub's already numerous enemies. Using a powerful weapon won in an earlier story, Itto kills 26 of the Kurokuwa ninja. Though it's questionable whether or not they could have truly been considered neutral up to this point - they did help Yagyo track Itto down in the previous volume - it is this battle that sets the Kurokuwa permanently on the side of the power-hungry Yagyu Retsudo. The final story of the volume, "One Stone Bridge," manages impressively to continue the previous chapter while mostly remaining a Daigoro story. Daigoro fishes and gathers in hopes of restoring his father, who lies unconscious from the wounds suffered in the previous chapter. A married couple finds Daigoro and brings a doctor to help. Itto is healed just enough to meet a trio of Kurokuwa ninja who arrive to deliver the news that their clan is at war with Itto, and to vainly try to end that conflict by taking Itto's life. The married couple plans to ask Itto to adopt Daigoro once he is well enough to take care of himself - an offer Itto would no doubt have refused - but they eventually decide against it. Seeing Daigoro's ceaseless devotion toward Itto, they assume Daigoro would be lost without him. As the couple walks away, Daigoro's longing for a mother, father, and a normal life is clear to see. I skipped a couple of stories there. There's "Deer Chaser," in which a group of con men and women scheme to pose as Lone Wolf & Cub only to run into the real thing. There's the title story "Lanterns for the Dead," in which a pair of low-level yakuza are mercilessly slaughtered for what amounts to a momentary error of etiquette. I can only think of two truly noteworthy things to say about it. First, it isn't until just now that I realized Itto's motivations are fairly mysterious in this story. He attacks his target "Mankiller" Isaburo only after Isaburo kills the second yakuza, though we never learn who hired Itto. That isn't necessarily rare, though we usually get some indication as to why his targets are, in fact, targets. It makes you wonder if Isaburo ever was a target, or if Itto acted purely to right a wrong. Second, for some reason there's actually some confusion about the name of this story. The table of contents lists it as "Lanterns for the Dead" while the title page names it "Floating Spirits." I have to admit a bit of tunnel vision in terms of my review of Lanterns for the Dead, but it's tough to avoid. When I think of Lone Wolf & Cub stories that resonate, "Hunger Town" is one of the first that springs to mind. There isn't much that's more powerful than the bond between a boy and his dog. Ask Harlan Ellison. P.S. I'm partial to cats, but I figured that caveat would've weakened that last paragraph.